﻿ Customer wins £500 in Caravan Guard dealer prize draw! 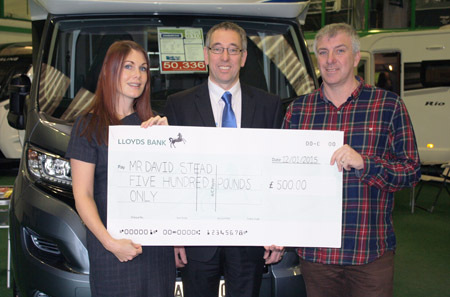 Lowdhams customer wins £500 in Caravan Guard dealer prize draw! Imagine one Lowdhams Leisureworld customer’s delight when, after going along to the dealer’s open weekend in Huddersfield and entering a free prize draw, he was later handed a cheque for £500 from Caravan Guard! That’s exactly what happened to David Stead, our most recent ‘Win £500’ competition winner. Our latest ‘Win £500’ free prize draw is now available for you to enter at dealer shops, services and show rooms up and down the country. Drawn each year, the competition has proved a huge success with dozens of winners and thousands given away in prize money! Keep an eye out for ‘Win £500’ flyers in your local dealership – next year’s prize money could be yours!